Ever wonder what happens to CESA players after they leave Classics Elite? Many of them go play soccer at universities and college level (D1,D2 and D3) and participate in many NCAA activities. This is the case with 3 former players, David Anderson, Clay Middleton and Tommy Barros. They all play for Trinity University under the direction of Coach Paul McGinlay. They recently played in Brazil against 3 professional teams: Fluminense, Flamengo and Botafogo and they defeated top club Botafogo in an outstanding victory of 4-2 with a goal by Clay Middleton and various assists by CESA former players. 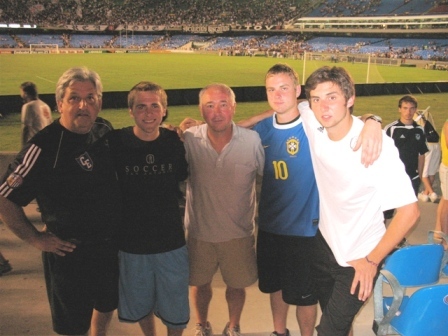 Above is a photo of the CESA players next to Coach Paul and president Marco Barros at a game at Maracana Stadium, the largest stadium with seating capacity of 120,000 people which will be the home for the World Cup finals in 2014. ©2019 Classics Elite Soccer Academy / SportsEngine. All Rights Reserved.